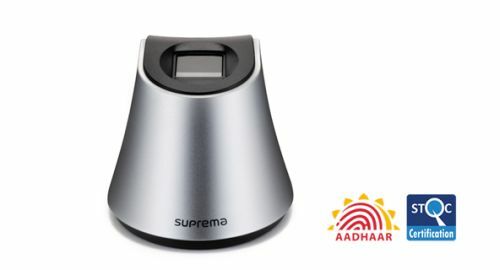 SEOUL, KOREA, May 11, 2018 - (ACN Newswire) - Suprema ID, a global leader in biometrics and ID solutions, announced today that its latest BioMini Plus 2 fingerprint authentication scanner tested in full compliance and received a UIDAI Registered Device Level 0 certification from the Government of India's STQC (Standardization Testing & Quality Certification). The STQC certification is an essential requirement for procurements of India government's nationwide UID project and ensures devices to satisfy API specifications presented by UIDAI. The recently introduced 'UIDAI Registered Device Level 0' certification heightens level of security of biometric data with encryption and digital signature. Designed for both PC and mobile based fingerprint authentication, BioMini Plus 2 provides loads of innovative features to enhance its image quality, performance and mobile-readiness. Unique to the industry, Suprema's patented Multi Dynamic Range (MDR) technology guarantees high-quality image capture even with extreme conditions (operates under direct sunlight up to 100,000 LUX) regardless of the moisture level of captured finger skin. The MDR technology is especially developed for mobile environment where there are greater dynamics in lighting and moisture conditions. "BioMini Plus 2 has been specially developed to meet stringent requirements for the India government's UIDAI projects which demand fast and high quality image capturing. In addition, with its compatibility to Android systems, mobile-oriented MDR technology, and anti-spoofing LFD, we are confident to gain further market share over UIDAI projects as well as fast-emerging biometric identification projects in many countries," said Bogun Park, CEO at Suprema ID. Suprema ID will present full demonstration of its STQC-certified BioMini series fingerprint authentication scanners and RealScan series enrollment scanners at International Police Expo in New Delhi on May 10-11. To experience the latest innovation in biometric ID solutions, please visit Suprema ID stand B30 at International Police Expo 2018 or book a demo at www.suprema-id.com. Suprema ID is a leading global provider of biometrics and ID solutions. By combining the world's renowned biometric algorithm with superior engineering, Suprema ID continually designs and develops industry-leading products and solutions. Suprema ID's extensive range of portfolio includes fingerprint enrollment scanners, fingerprint authentication scanners, fingerprint embedded modules and ePassport readers. Suprema has provided national ID projects in more than 20 countries and over 1 billion people in the world are using Suprema ID's fingerprinting technology. For more information, please visit www.suprema-id.com.